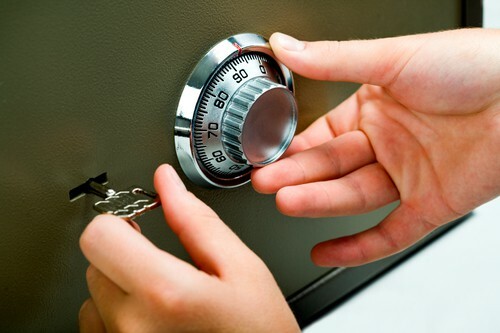 Knowing how to reset and change the combination on your safe is something very important to know. One of the ways to get the most use out of your safe is to regularly reset and change the combination to your safe. It is recommended that in order to secure some of your most treasured belongings that you should rest and change the combination to your safe. When safes are sent from the manufacturers they are equipped with the same combination. This is done so that the retailers are able to open the safes to be put on display. It is up to the consumers to change that combination. Please enjoy this step by step guide to changing the safe combination in your home. You will need to determine where the marks are that open and close the lock. On a traditional Chubb Lock and Safe, the arrow will be located at the top of the circle to open the lock. Then you will find a line to the left or right of the arrow and that is where you are going to change the lock. It is important to align all the numbers and notches perfectly to allow the lock to open. After throwing the lock bolts they will extend into the correct position. Once this happens you can now open the door of the safe. Then once the combination has been entered the change mark will be removed. Rotate the dial counterclockwise until you see that the first number has passed the zero three times. Now on the fourth turn line up the first number with the number on the change mark. Turn the dial clockwise until the second number has passed the change mark two times. On the third turn line up the second number with the change mark. Turn the dial counterclockwise until the third number passes the change mark once. Then you will stop once the third number lines up directly with the change mark on the second turn. Insert the change key into the back side of the lock. Turn it a quarter turn counterclockwise. Now you will need to think of a new combination making sure the last number is higher than 25. Think of a combination of numbers easy for you to remember but not so easily guessed for others. One trick we recommend is thinking of a word that consists of the same amount of numbers needed for your combination. Then you would simply take the word and spell it out with a keypad on a telephone. Now those numbers will be the numbers you will use for your combination. Now put in the new combination you came up with. For this step, you will be repeating everything that you just did in steps 3-5. You are going to keep the third number on the change mark as you turn the change key back a quarter turn back clockwise. Congratulations now you have successfully reset and changed the combination on your safe. This process can be repeated as many times as you find necessary. Just be sure you write down and keep up with your combination each time. If you are locked out of your safe, or just simply have forgotten your code, Sevan Locks & Doors is here to help! We can have you back in your safe in no time. Call us now for service.